Provence-Alps-Côte d'Azur is located between the Mediterranean coastline and the Alps and stretching from the Italian border at Menton to just the other side of Marseille, then north to the Haute-Alpes. Not bad we say! Its location and climate are extremely attractive with a warm weather, clear light and varied landscape. The Cote d'Azur is a long succession of fashionable resorts, marinas and beaches, with a wide choice of activities for all tastes, which can be enjoyed throughout the year. Magnificent scenery combined with a rich historical past of remarkable archaeological and architectural interest, together with a multitude of celebrations and festivals make it a very interesting area to visit. Every city, town, village and resort is perfectly prepared to accommodate and cater to the needs of the tourist trade with a wide choice of places to stay – from a luxury city hotel to a charming country bed & breakfast. The seaside resorts are the last word in aquatic sports – and they also offer other entertainment. The mountain type and the trekking enthusiast will find a varied countryside, from flat lands to the majesty of the Southern Alps. It is surely one of the foremost European tourist regions. In less than two hours you can travel from the palms and lemon trees of the coast to the nearby Alpine peak, for coolness in the summer and snow sports in winter. A place to spend quality time any moment of the year. 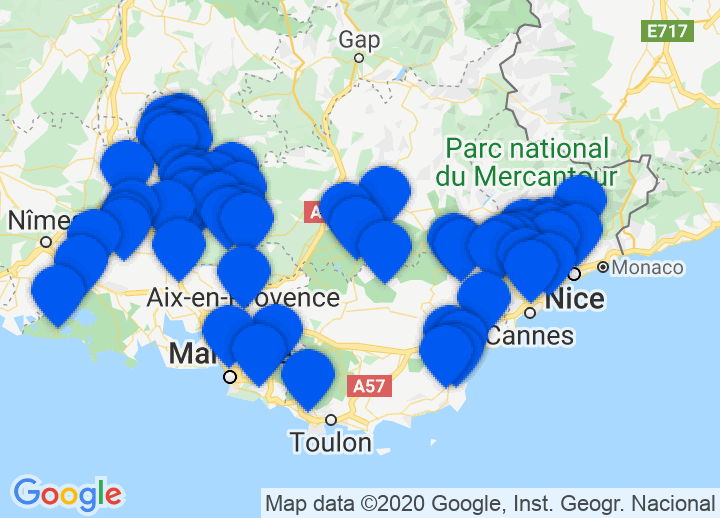 Choose from our selection of romantic French Riviera hotels, Côte d'Azur hotels and Provence hotels catering to a variety of tastes and budgets including authentic and stunning Bed and Breakfasts on the Côte d'Azur and luxury French Riviera hotels amongst others. Are you looking for a manor house in Vaucluse or a bed and breakfast in Var? For sure, we'll find the right place for you! Almost everywhere in the countryside is excellent for walking, riding and cycling. There are well-marked hiking routes for short walks – yellow and red signs – lasting between one and four hours. Or walks – white and red signs – lasting several days, that can include if one requires it a mountain guide. If you are a rock climbing enthusiast, there are more than seventy canyons to choose from. This is an outstanding gliding country and there are several bases that provide beginner and intermediate courses with qualified instructors. More experienced pilots fly towards the Alps as far as Mont Blanc or Mont Viso. The thermals provide excellent conditions for hang-gliding, paragliding and ballooning. Good fishing in the lakes, perch, carp, char, gudgeon and in the mountain streams, wild trout. In winter, the combination of sun and exceptional snow cover, make excellent skiing and there are many resorts to choose from. Pra-Loup and Foux d'Allos are linked together to form one of the largest ski areas in the southern Alps. Chabanon, Grand-Puy, Soleilhas-Vauplane and others are more family oriented. Provençal food is perhaps best described as a series of exquisitely prepared dishes using seasonal local produce; a plate of olives with a sprinkling of thyme, an onion and anchovy tart, a bowl of green figs, farm cured mountain ham with sweet butter, a dish of artichokes, lamb cooked slowly on a spit, Arles sausage, ewe's milk cheese wrapped in chestnut leaves. The natural caves near the ochre and red village of Roussillon are used for the cultivation of mushrooms. Le Thor supplies the region with grapes. And Carpentras is the centre of the lively market for black truffles. The proximity of Provence to Italy has had an influence and there are excellent pizzas, drizzled with chilli oil to bring out the taste. In the mountain areas there is fresh water fish grilled or baked with herbs and in the south bouillabaisse, a fish soup that belongs to Marseilles.